The SubRegs field is a zero terminated array of registers that are sub-registers of the specific register, e.g. AL, AH are sub-registers of AX. The SuperRegs field is a zero terminated array of registers that are super-registers of the specific register, e.g. RAX, EAX, are super-registers of AX. Definition at line 98 of file MCRegisterInfo.h. Definition at line 99 of file MCRegisterInfo.h. 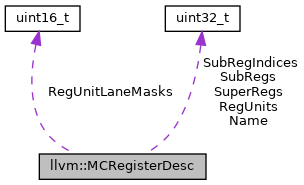 The sequence contains a lanemask for every register unit. Definition at line 113 of file MCRegisterInfo.h. Definition at line 109 of file MCRegisterInfo.h. Definition at line 105 of file MCRegisterInfo.h. Definition at line 100 of file MCRegisterInfo.h. Definition at line 101 of file MCRegisterInfo.h.